It's obviously spring in our front yard. The wisteria is awake! I think we got a little burned out on working on the house. We've been working on this project pretty steadily for 2 years and I guess we can deal with some time off. We're still goofing off except for things like laundry, dishes and cooking — boring stuff. I've gotten hooked on Grey's Anatomy. Jeff is still really enjoying his computer game, Forge of Empires. It's looking like this might not be such a productive spring. 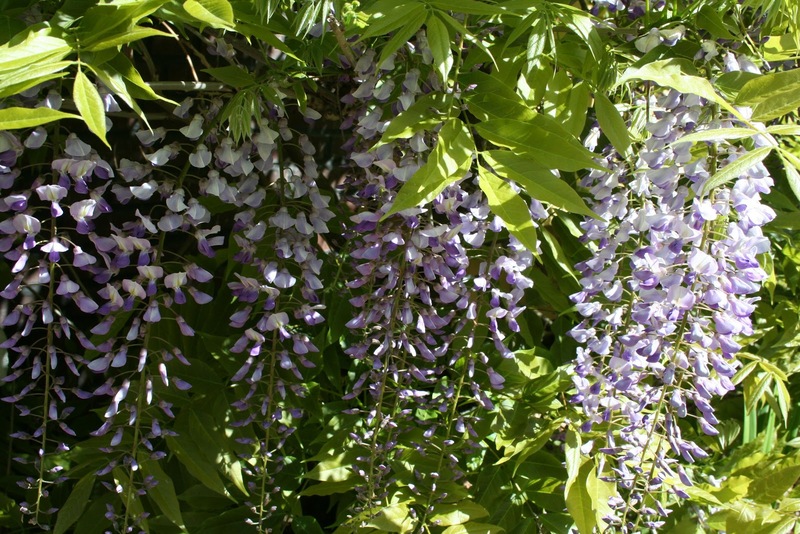 The wisteria can be productive for you! Mine isn't going to bloom after all. The bud dried up and fell off. I'm going to try hacking it back (like you did) and see if next year is prettier. 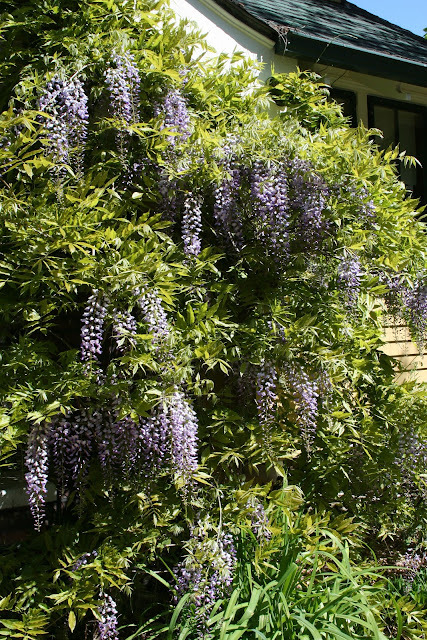 Wisteria is wonderful but you do have to work hard to keep it from destroying everything....it's a little vigorous. It is vigorous -- too vigorous. It's already crawling into our new siding. But it's been planted in that spot since Mr. Manning planted it there after they bought the house. It deserves to stay. We try and chop it back every year. It CAN be pruned nicely. There are some porches in our area where it looks really nice and is under control. It is important to learn how to prune and not just chop. 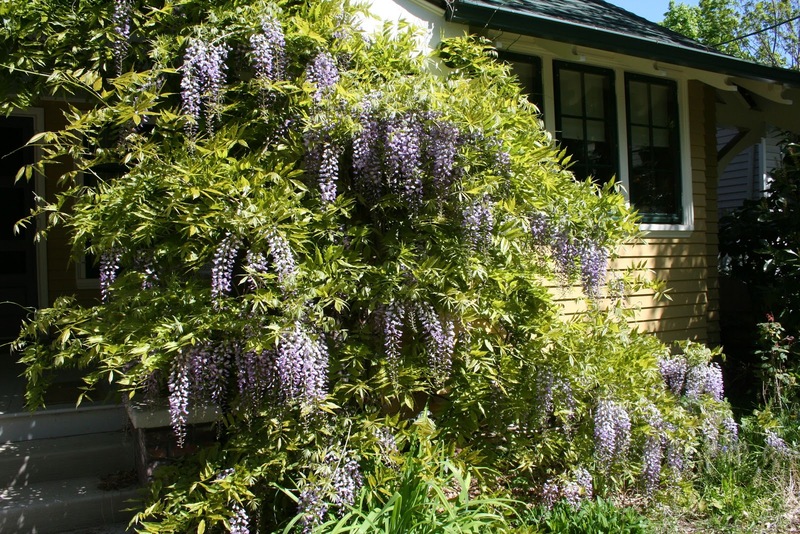 My Wisteria was eating our deck, so I moved it to a stake in the yard, but it kept gettting bigger and heavier and sending out runners every year, so I finally bit the bullet and removed it, though it is still trying to come up by the deck. Yours is lovely, I hope it keeps blooming longer than mine would. Hi! I love your house and your website! Someone just recommended it to me as I am a house enthusiast myself. I was wondering if you might be interested in having the 'before and after' pictures of your craftsman featured on my site House Crazy? We planted our wisteria about 6 years ago and are still waiting for it to bloom. I read somewhere that it can take up to 7 years to bloom. Yours looks gorgeous!